You may have heard about genetically modified oraganisms (GMOs) in your foods. But GMOs in your skin care or cosmetic products? How could that happen? Believe it or not, it’s happening in manufacturing plants every day. Here’s more about GMO-beauty products, and how you can identify and avoid them. Take a closer look—there could be GMOs in your personal care products. The World Health Organization (WHO) describes GMOs as “organisms in which the genetic material (DNA) has been altered in such a way that does not occur naturally.” Also called “genetic engineering,” “biotechnology,” and “recombinant DNA technology,” it consists of inserting genetic fragments of DNA from one organism into another. A number of vegetable crops have been genetically engineered to either be resistant to herbicides or to create their own insecticide. Scientists can make them either tolerant to large amounts of toxic chemicals (including Monsanto's RoundUp) so they survive large doses of pesticides, or less likely to be destroyed by insects because they’re engineered to contain a toxin that actually breaks open the insects’ stomachs to kill them. Sometimes even both of these methods are used. Other foods may be genetically engineered to resist disease or drought, or to contain added nutrients. Today, GMOs are present in about 60-70 percent of foods on supermarket shelves, according to the Center for Food Safety. 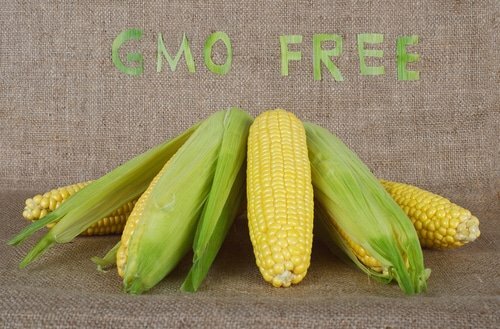 Most all of our processed foods contain some GMOs, as common ingredients like corn starch and soy protein are mostly derived from genetically modified crops. Fresh fruits and veggies are mostly GMO-free, though some sweet corn (released 2012), papaya, zucchini and squash may come from GM crops. The genetically engineered non-browning apple is now up for approval, so you may see that in your supermarkets soon. According to the American Academy of Environmental Medicine (AAEM), several animal studies have indicated serious health risks associated with eating GM foods, including infertility, immune problems, accelerated aging, insulin regulation, and changes in the liver, kidney, spleen, and digestive system. In addition, studies have linked GM foods with asthma, allergies, inflammation, and intestinal damage. The Academy goes on to recommend that physicians educate their patients and the public to avoid GM foods when possible, and to consider their possible role in the disease processes of their patients. The Academy is talking about eating GMO foods, but since we know the skin can absorb at least part of the ingredients applied to it, it makes sense to avoid these ingredients in our skin care, as well. Currently, GMO-labeling is a requirement in Europe, but not in the U.S. That means these products can show up in your foods—and your personal care products—without your knowledge. Many of the common ingredients we find in personal care products come from agricultural sources—and these sources may contain GMO products. Take lauric acid, for instance. A saturated fat used as a moisturizer in a number of lotions and creams, it may come from coconuts, but it can also be made from canola. Because of the high demand for lauric acid, canola has actually been modified in some cases to produce high levels of it. This makes it a cheaper ingredient, which manufacturers like, but it is a GMO product. As farmers started growing more and more genetically modified crops, the results were used not only in our food supply, but in our cosmetics, as well. Today, it’s possible to find GMOs in anti-aging creams, lotions, and body washes. Watch out particularly for papaya enzyme masks, or soybean oil in moisturizers. To increase your odds of avoiding GMOs in food, shop organic, and check out this non-GMO shopping guide provided by The Institute for Responsible Technology and The Non-GMO Project. Look for “GMO-Free:” Some brands are announcing that their “GMO-free” in response to customer concerns. Look for this label when shopping. Look for seals: The USDA certified organic seal, for example, means the product is 100% organic and contains no GMOs. The “non-GMO certifcation label” (an orange butterfly) signals verification by the Non-GMO Project, and gives you assurance that you’re not applying GMOs to your skin. Shop at natural foods stores: These are more likely to carry GMO-free brands. Shop Annmarie Gianni: We don’t use GMO-sourced ingredients! Do you shop for GMO-free beauty products? Please share your thoughts. Maggie Caldwell, “5 Surprising Genetically Modified Foods,” Mother Jones, August 5, 2013, http://www.motherjones.com/environment/2013/08/what-are-gmos-and-why-should-i-care. Amy Dean and Jennifer Armstrong, “Genetically Modified Foods,” The American Academy of Environmental Medicine, https://www.aaemonline.org/gmo.php. Edison de Mello, “What’s the Big Deal About Genetically Modified Organisms?” Huffington Post, September 19, 2013, http://www.huffingtonpost.com/edison-de-mello-md-phd/gmos_b_3854198.html. Simon Pittman, “Non-GMO labeling—the next cosmetic certification trend?” Cosmetic Design, January 16, 2013, http://www.cosmeticsdesign.com/Market-Trends/Non-GMO-labeling-the-next-cosmetic-certification-trend?utm_source=RSS_text_news&utm_medium=RSS%2Bfeed&utm_campaign=RSS%2BText%2BNews. Please don’t forget about behentrimonium chloride which is found in EVERY single bottle of hair conditioner. It is ONLY derived from canola oil. Ethyl Alcohol can also be derived from canola oil. I believe that most people are sensitive to canola oil. In my household, we were having issues with headaches and migraines which cleared up after removing canola oil from our lives. Also, my teen’s acne cleared right up! Question, which of the items on your list are canola derived? Are all annmarie gianni products soy free? The Vitamin E Tocopherols and glycerin in some of our products are derived from non-GMO soy. If you’re allergic to soy, it’s unlikely that you would have an allergic reaction since the proteins have been removed in these. Also, extracts like these are pure and there’s no trace of the allergen one would have in, say, a pure soy oil. With this said, you may want to do a patch test on a small area of your skin, like the inside of your arm, and wait about 15 minutes to see if you have any type of reaction. I have been moving away from GMOS as I become more & more educated … I find the entire issue very disconcerting and my trust level extremely low – a very sad state of affairs unfortunately. I cannot for the life of me, understand how a product c an be labeled: organic and be stamped with a ‘Non-GMO VERIFIED’ Label when it contains CANOLA OIL, Garden of Eatin Chips for instance. It is an oximoron. Sad. Not all canola has GMOs- there is organic canola oil. If the product is certified organic, and has canola oil, then it’s organic canola oil. Um – guess I was wrong!! !